Have you noticed how mo' men have facial hair around this time of the year? Yes, Movember is here! Movember is more than just a month when men grow impressive moustaches like gentlemen do. The word Movember is a mashup of the words 'Moustache' and 'November'. Quite clever, isn't it? Movember is a classy way of getting attention to highlight the health of men and raise awareness of awareness about cancers that affect men. How did it all begin? The origins of Movember can be tracked back to 2003, in Australia, bless the Australians for such a brilliant idea, over a couple of beers. Hey, no great story ever began with 'So, I was eating a salad.' You can read about the history of Movember on their website. According to the Movember foundation website 'Gender is one of the strongest and most consistent predictors of health and life expectancy. For men, this is not good news. On average, across the world, men die 6 years earlier than women. Moreover poor mental health affects men more than women: three quarters of suicides are by men. The World Health Organisation estimates that 510,000 men die from suicide globally each year. That’s one every minute.' The statistics for prostate cancer is appalling as well. To cite the website, 'Prostate cancer being the second most common cancer in men worldwide and the number of cases expected to almost double to 1.7 million cases by 2030.' DOUBLE TO 1.7 MILLION CASSES. You wouldn't guess the statistics were that horrid but that's what Movember is all about; to bring awareness and change the face of men's health. Kudos to the creators for bringing light to the issue. 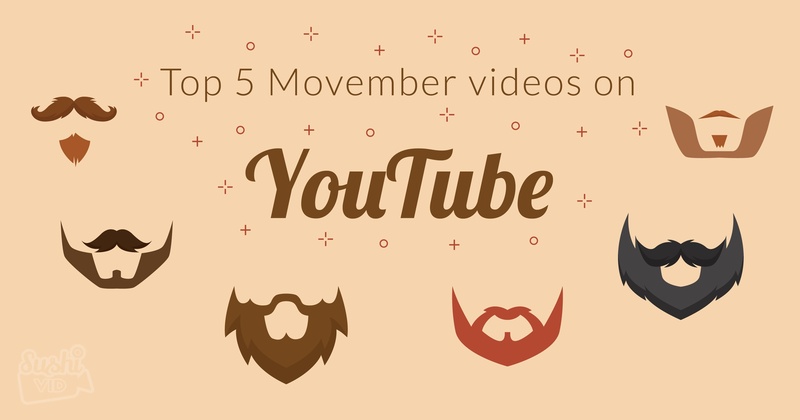 To celebrate Movember, SushiVid have picked 5 Movember videos to share with you. The video was made by the YouTube channel Made Man, and they're notoriously known for their sarcastic, dark humour. This video offers 'advice' on steps to grow facial hair and presented by Nick Offerman. Nick Offerman 's glorious facial hair is the envy of every man. Hey, growing a 'stache is a gift! This parody of Call Me Maybe made by Derick Watts and the Sunday Blues pretty much sums up the lives of guys who are struggling to grow the moustache. Yes, we know not everyone can grow one or have the patience to let it grow in the first place. Patience is a virtue and don't give up if progress is slow. But if it's not happening, you could always still donate to the cause and still raise awareness. Manners maketh man, not his moustache. For those of you who don't know who Christoph Waltz is, he stars in the new James Bond movie, Spectre as Oberhauser. And if you don't know Jimmy Fallon... That's impossible right? He's right up there with Ellen DeGeneres and Jimmy Kimmel. Christoph Waltz is an ambassador for Movember and comes on The Tonight Show with Jimmy Fallon and talks a little about the origins of Movember and what it is about. Good way to promote Movember in the US. Jimmy mentioned that he's fairly new to the idea of Movember and that's because another similar concept, No Shave November, is widely famous in the U.S. What's the difference? No Shave November involves no shaving at all and the money that is usually spent on razors and shaving would be donated to the same cause, men's health. As far as growing a moustache is a gift, styling one is a skill. Nobody likes an unkempt moustache. A gentleman always presents the best version of himself. There are 40 styles of moustaches to pick from; whether you choose the classic styles like the or decide to go with something comical like the The Mario and Captain Jack. Or if you wanna try the Adolf Hitler. On second thoughts, don' try the Adolf Hitler. Maybe rename that to Charlie Chaplin? Let's not be insensitive now, shall we? Growing a moustache is great but let's not forget the real cause behind it. Don't forget to visit the Movember Foundation official page to learn more and don't forget to donate! Together we can help to change the face of men's health or check out how social media can be a positive force for change.